Help martins colonize in your garden by placing this Heath Deluxe Purple Martin Gourd in it. This hardy, molded plastic unit is full of wonderful features, ensuring martins have a comfortable and durable roosting spot. The generous, 9" deep chamber provides these birds plenty of nesting area, which the birds access via the crescent shaped, starling resistant entry. A generous landing platform extends from this opening, with a textured finish that mimics cobblestone for birds to easily grip it. This porch also creates an inside landing for martins, and can be removed for a different look. A molded, peaked roof above the front opening prevents rain from entering the piece, and holes on the base of the unit help keep the nest dry. A side, threaded access port with a screw-on cap makes nest checks and maintenance simple, and the beige color ensures the interior remains cool. Predrilled holes at the top of the gourd accommodate a 3/8" diameter hanging rod, and allow you to orient the item in two different ways for versatility. The sturdy, all plastic construction remains durable, while its innovative features are fantastic for martins. 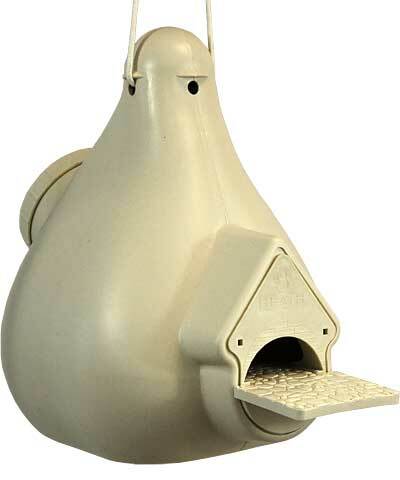 Add convenient martin housing to your bird garden with this Deluxe Purple Martin Gourd.